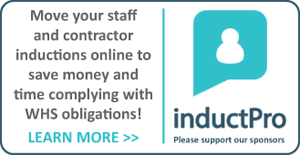 Should an employer that is fined for non-compliance under the WHS laws be able to have the fine paid for by their insurer? Right now a legal loophole exists that allows insurers to pay fines handed down to businesses with unsafe workplaces. In South Australia this is an issue currently under scrutiny at a meeting of state Attorneys-General. The move was prompted by the death of a worker at Adelaide’s desalination plant in July 2010. Brett Fritsch, 35, was killed when a 1.8-tonne steel beam fell onto him from a crane while being moved in a soft sling during building work. Rigging company Ferro Con SA and its director were prosecuted for breaching workplace safety laws. The company was fined $200,000. However that cost was covered by its insurer. Unions called on the Government to close the loophole, saying it allowed companies to put a price on workers lives by making it cheaper to get insurance instead of implementing safety systems. South Australian Attorney-General John Rau says businesses should not be able to choose insurance over safety. Mr Rau says he will raise the issue at today’s meeting of state Attorneys-General. “Imagine if you were able to get an insurance policy that said somebody else would go to jail if you committed an offence. What we’re looking at here is something pretty well in that space. Somebody else pays the fine instead of you,” he said. “As the law presently stands, if a company receives a $10,000 fine or a $10 million fine from the Industrial Court, if they are insured, the consequence may be the same – no impact,” Mr Rau said. Mr Rau said while most employers did the right thing, the dodge effectively meant the incentive for a company to provide a safe environment for its workers was diminished or eliminated. “This is not the message we want to send to South Australia’s employers or our state’s workers,” he said.